My Larder Family Tree originates in the central part of Somerset, England, around the village of Wedmore. There is a long history of Larders within the area which we have dated back as far as the mid 1400's. Though we're still trying, we haven't yet formed links for our own ancestry quite as far back as this. I've followed a line of ancestry back to the mid 1600's. Although there is a tendency for the surname to vary, this does not tend to create major problems. I am keen to hear from anyone with the surname of Larder, or any of its variants, especially if you have origins in the Parishes of Wedmore or Meare or know of any connections with Larders in other areas and would be happy to share my data. 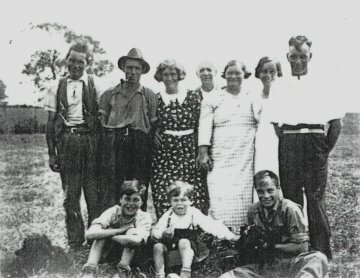 Although I've already made contact with descendants of Larders who travelled abroad, specifically to America and Australia, during the 19th Century, I'm especially keen to hear from anyone who has any further information about these lines of the family and to develop a world-wide network of Somerset Larders. My findings are developing continually, and I've got a lot more information than is listed on these pages, so feel free to contact me.